Comic Pop is a ridiculously fun way to add energy and action to your commercials, business videos, wedding films or any video project. It comes with 60 hand-drawn comic book style animations that will give you a professional look in seconds and save you tons of money! 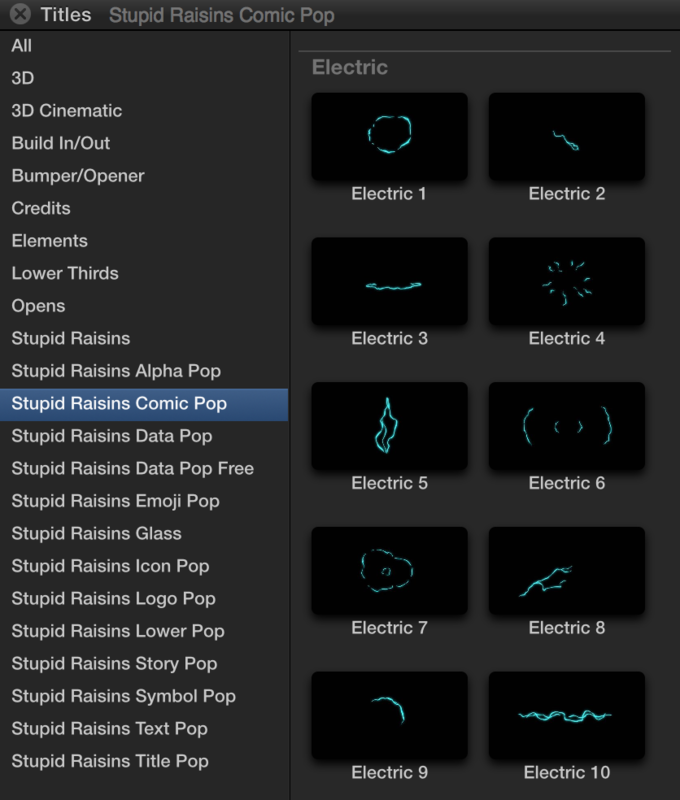 In addition to the animations, Comic Pop comes with 2 title templates, 2 logo templates and 2 transitions. All Comic Pop’s animations are perfect for all professional applications including broadcast. The animatinos are vector based so you can change the size without any resolution loss! Use these animations to add energy to your next video production. Quickly add a uniquely animated element that will impress your clients, boss, friends and family. The polished look of the animations will make your clients think you hired a professional animator. Don’t worry, we’ll keep that our little secret. Comic Pop has 60 customizable animations in 6 categories. 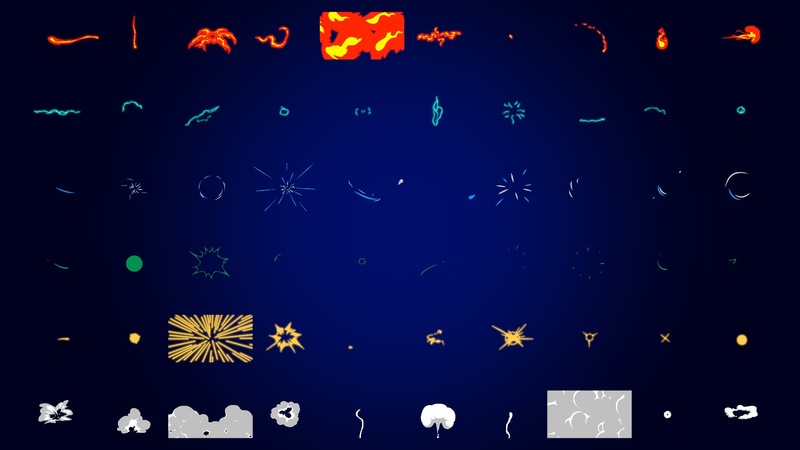 There are electric, energy, fire, lines, shapes and smoke animations. There are so many ways to add dynamism to your project. Each category includes 10 separate animated templates. The following clips show all 10 animations one after another. The wedding video you’re working on is very important. The day was beautiful, the bride and groom were glowing and the scenery is breathtaking. You have a simple, clean title to open with but it’s lackluster. It needs a pop. Add a couple accents and your title is complete! Imagine you’re on the beach enjoying an amazing vista. How do you feel? If you’re like me you’re happy, excited and full of energy! Add those feelings to your next business or travel video with moving sharp lines that convey a fresh look on life. Electrify your next non-profit video project with flying Tesla arcs and sparking electrical bursts. Amp up your message to draw the viewer in and to move your story along. You’re making an event announcement video and you want to show the event’s energy. That’s quite simple with some puffs of smoke. It works really well as a highlighter when you place them behind your text or logos. When you’re showing off a product it can get lost in the action shots. Use some spirals, bursts and circles to bring interesting focus to your product. It also works great for accentuating text and titles. Comic Pop’s energy animations are a simple and eye-catching way to emphasize the motion of an action packed clip. Follow the curves with a sweeping energy bolt and zap the turn with an energy blast. Sports are already high energy so Comic Pop’s animations fit right in. Use bursts, streaks and tunnels to emphasize the athlete’s movements! Create electrifying or modern titles! You can create titles easily with Comic Pop. Comic Pop comes with 2 title templates or you can create your own custom animated title. Energize or set your logo on fire! Comic Pop is the perfect way to add some life to company logos. You can use the 2 included logo templates or build your own logo animation.